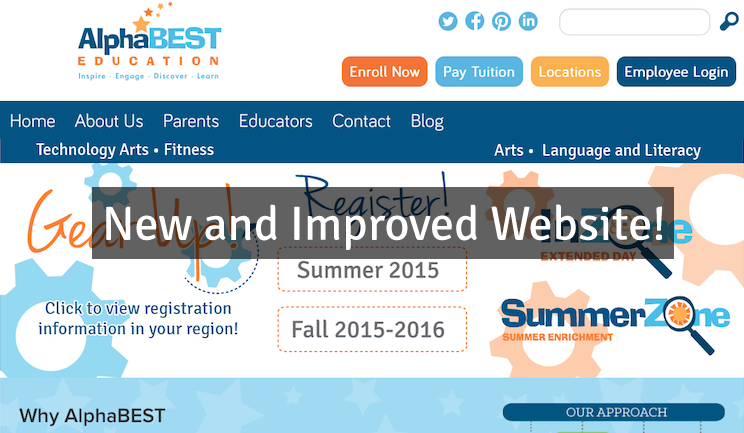 website redesign Archives - AlphaBEST Education, Inc.
Spring connotes “growth” and “rebirth”, so with the season in full swing, we are excited to announce our website redesign! Based on user feedback and extensive testing, the new design features improvements in functionality and user experience. The clean, modern design better represents AlphaBEST’s commitment to cutting edge curriculum and innovative expanded learning programs. Enhanced content allows parents, school districts, vendors and other partners to easily access information about our curriculum and program offerings. With our new ‘Locations’ feature, parents can easily search for AlphaBEST programs in their area. A revamped registration portal simplifies the enrollment process for families, allowing them to bypass our third-party registration system and re-register through the website. The updated Employee portal grants staff access to important forms, training resources, new hire information and more. With the new responsive design, visitors can view the website whether they’re using a mobile device, laptop or desktop computer. Go on, explore our website redesign and view the new features for yourself!